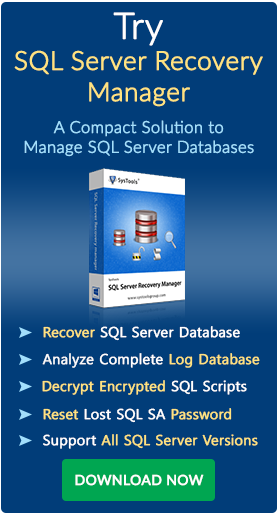 Instantly get back your lost or forgotten SQL server password protecting your SQL server databases with SQL Password Recovery software. This advance MS SQL Server password recovery tool is the perfect solution which supports all the SQL Server editions up to latest 2017. There is least possible need to install Microsoft® SQL Server for recovering passwords. This quick result provider solution detects the whole situation minutely and then provide recovered SQL server password. The automated functioning of the software helps you to overcome absence of SQL server passwords situations. No matter how long is your SQL password is or how complex the password is or in which language the password is. MS SQL Server Password Recovery Tool simply recovers SQL password with no further attacks from virus like situation because this is safe utility. So, do not wait anymore, move ahead and get your SQL password quickly. In your organizational premises, creation of large databases is daily operation. You keep all your data safe and protected with SQL server passwords. Because of confusion, you somehow unable to recall the correct password and every time you enter the password, data fail to get opened. To discard this situation forever, you have decided to perform MS SQL Server password recovery. The scenario like this happens daily with many entrepreneurs. However, our SQL Password Recovery software acts wonderfully to overcome this situation emphatically. Single-click operation will lead to recovery of SQL server password. Work with any language and any length of the SQL password. Software supports to reset forgotten password of SQL versions 2017, 2016 and all below versions. 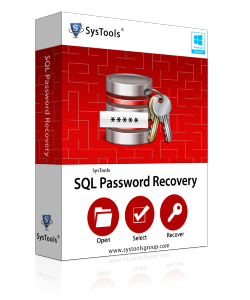 The priceless trial mode of SQL Password Recovery tool shows you working and features to be used in recovery of SQL passwords.